"The following paragraphs are taken from the Fifteenth Edition of the Young & Sons catalog dated January 1, 1896." "William J. Young invented the transit instrument in 1831, a long stride in the improvement of engineering appliances; and that it retains today its almost identical first form, proves the value of its introduction and the good judgment of the inventor. The English Theodolite, capable of performing the same work, was not in favor with the earlier American engineers, its workings being slow and inconvenient, and its use attended with many discomforts." 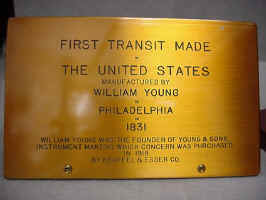 "In the year 1831, the first Transit was made by William J. Young. 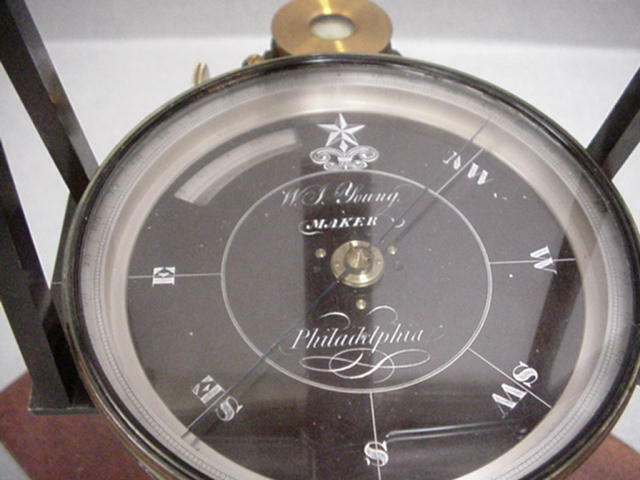 It was graduated to read by vernier to 3 minutes, it being in early days a favorite idea of inventor that graduations of 3 minutes could be easily read to one minute, and was less perplexing to use. The instrument had an outkeeper for tallying the outs of the chain, and a universal or round level. The needle was about 5 inches; the telescope 9 inches, of low power. The standards were of almost identical pattern now used by some makers."